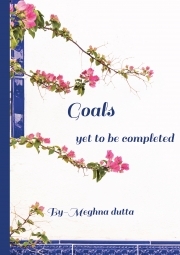 Description of "Goals:yet to be completed"
The book contains al my poetry. All the poetries are based on my thinking, but i am quite sure it will relate to you very muc. Poetry is something we feel and then weave them into beautiful line. I am microbiologist by degree and life made me into poet.poetry is my hobby. My strategy is don't waste time on getting work done. If you want to do something do it yourself. For me life is an ice cream. It will finish it gradually but if u want to enjoy it, enjoy it to your fullest but you have to be very fast. Reviews of "Goals:yet to be completed"